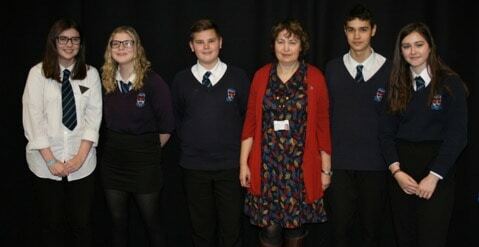 On Friday, 15th January, six pupils from Years 10 and 11 (Luke James, Jarrah Farkash, Mari Davies, Megan Wilson, Morgan Mason, Chelsei Griffiths) attended Carmarthenshire’s International Holocaust Memorial Day Conference. International Holocaust Memorial Day encourages remembrance in a world scarred by genocide. The conference allowed pupils to remember the six million Jews murdered during the Holocaust, and in the genocides which followed in Cambodia, Rwanda, Bosnia and Darfur. The 27th January marks the anniversary of the liberation of Auschwitz-Birkenau, the largest Nazi death camp located in Poland. At the conference pupils were given a talk by Marie-Christine Nibagwire, a survivor of the 1994 Rwanda genocide. Megan Wilson Year 10 asked her a question in front of the whole conference hall about her dream for the future and the reply was one about a future world where there is peace and love. Pupils also mixed with pupils from other schools in a workshop session led by the ‘Minority Ethnic Achievement Services Team’. The theme of the workshop was ‘Refugees Today’.